We do not modify the facial features during our face lift for a natural perfectly result. It is a non painful surgery that needs a social eviction of 3 to 5 days. We practice mini face lifts if needed with very small scars. The rates of our cervical facial face lifts vary between 5500 to 9000 Euros according to the difficulty of the case. 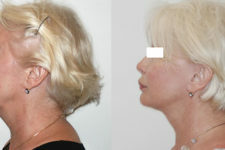 The procedure aims to tighten the skin the muscles of the face and neck (double plan lifting). To do so, we practice a hidden incision in the hair and the outer portion of the ear. For the people that are less than 50 years old, the scars can be limited to the hair and not be concerned the portion in front of the ear (mini face lift without visible scars). The neck muscles (that cause baleen) are settled backwards to redefine the angle of the neck and the jaw. The extra skin is pulled and the skin sutures are affected, in order to be the most discreet as possible. The procedure is often practiced under neuroleptanalgesia (local anesthesia further by tranquilizers administered intravenously) general anesthesia can also be considered if you wish. This will require a pre anesthetic consultation, at least 48 hours prior the procedure. A cardiologic consultation can be asked before the procedure if you have any particular arterial hypertension antecedents. In most of cases, the hospital stay lasts for a day (entry at 8:00am and leave at 7:00pm on the same day). You can also stay overnight for your comfort. The surgery is not painful; however a facial edema more or less important appears for 3 to 7 days. After the surgery, we recommend you to practice 2 to 4 facial lymphatic drainage with a physiotherapist specialist to limit the edema. We consistently practice a Botox injection 15 days before the surgery to release tension in the face muscles and to fix more precisely the tension during face lift. We prefer to practice a lot of small acts but without excess, in order to get the most natural results as possible. It is a simple surgery, not painful that gives great results when its preparedness has been meticulously done. What is the ideal age for a cervico face lift? There is no ideal age because it all depends on the quality of the patient’s tissue. However, we get the best results between 45 and 65 years old. 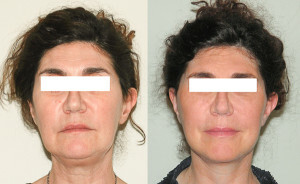 It appears to us that the practice of a face lift before 40 years old is useless besides exceptional cases (after a massive emaciation for example after the fitting of a gastric ring). The current method of cosmetic medicine allows us to delay the face lift, but we need to go through surgery once the sagging face has appeared. 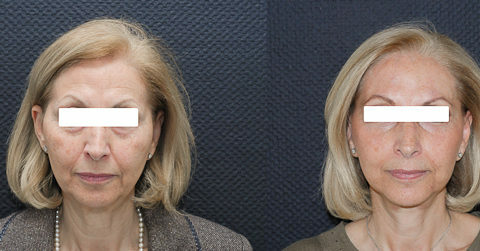 Is there any alternative to the cervico face lift? Yes and no. For moderated facial ptosis (falling tissues) some little “tricks” can be done for a satisfying result. 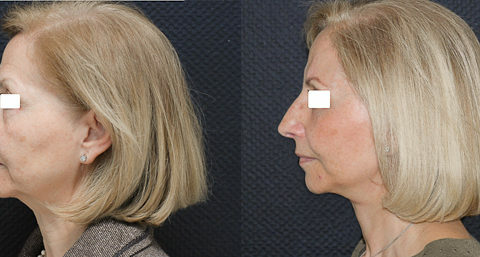 We can inject hyaluronic acid on the lower part of the bitterness fold in front of the jowl and redefine the oval of the face. A deeper on the cheekbones (vale of tears) can be improved by injecting radiesse. 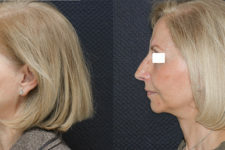 Nevertheless, those injections might burden the face and give a blown up aspect (pillow-look). 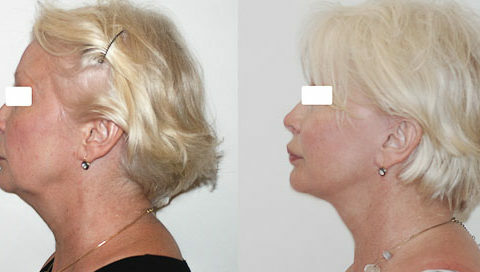 The face lift remains a benchmark treatment for the sagging faces and neck. 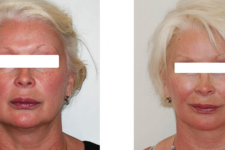 What are the potential complications of a cervico face lift? The main complication of a cervico face lift is hematoma which is a blood clot that can appear on the same evening as the procedure. It is anticipated by maintaining a stable blood pressure before, during and after the surgery. The ratio of hematoma is reduced by using local anesthesia with deeper sedation. The sensitivity of the contour of the ear can be reduced in a transitory manner. At least, in some exceptional cases, we can observe some dermal neurosis (more common for smokers) and face muscle paralyses which are more temporary. Those complications are more rare and usually do not leave any aftereffects they are correctly threatened. Nonetheless, the postoperative edema can be more serious and requires a social eviction which varies between 3 to 7 days. When can we go back to a normal social life after a cervico face lift? The postoperative facial edema can be impressive the first 3 days. We can usually go out with a scarf and sunglasses after the 5th day. An almost normal social life can be considered between the 7th to the 10th day if the postoperative instructions have been well applied. What are the cares after a cervico face lift? A mild shampoo is applied on the next day of the procedure and can be repeated everyday. The healing treatments are simple and consist in disinfection. The stitches in front of the ear are removed between the 7th to the 10th day. The surgical staples located in the hair are removed on the 15th day. It is important to sleep with your head elevated with 2 pillows during the following week of the procedure. A cervical support girdle or “press lift” can be worn during the day. We always give a prescription of 2 to 4 sessions of facial lymphatic drainage with a specialized physiotherapist. How much is a cervico face lift? 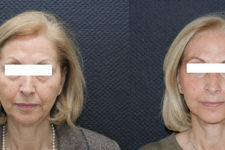 A simple cervico face lift costs 5500€ to 7000€. With some associated acts (lipofilling, eyelid, chin implant), the price can go up to 9000€. A budget of 200€ to 400€ should be considered for the postoperative sessions of facial lymphatic drainage.